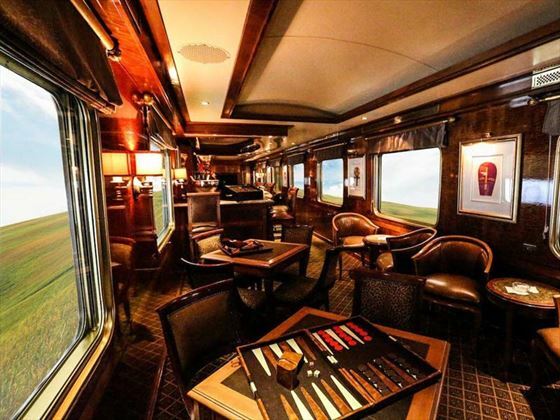 The Blue Train is one of the world's most luxurious trains, travelling from Cape Town to Pretoria or vice versa. 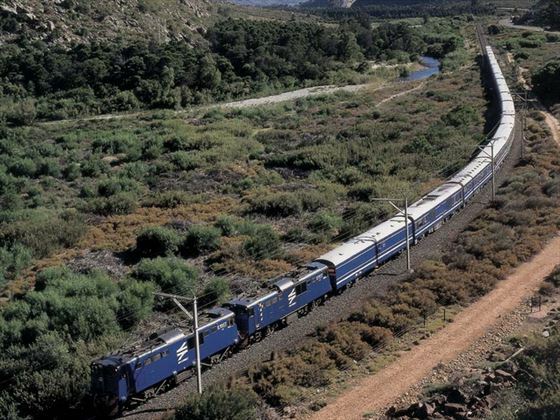 Your rail journey takes you alongside rugged mountains, through the wine region of the fertile Hex River Valley and up and inwards to the swathe of landscapes of the Karoo. There is something to see from your luxurious private cabin every minute. Without doubt, this is a rail journey of luxury and style with a feeling of a bygone era. It has to be on your wish list, for sure. 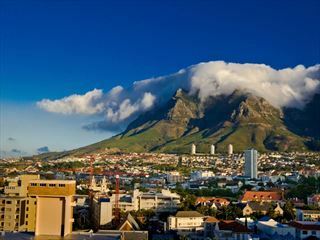 The Blue Train departs Cape Town and Pretoria on selected Mondays, Wednesdays and Fridays. 07:50 - 08:30 Register and check-in at The Blue Train Lounge, Cape Town Station. Enjoy pre-departure snacks and drinks. 08:30 Boarding starts. Butlers usher you to your suites. Suite orientation is done by the butlers. 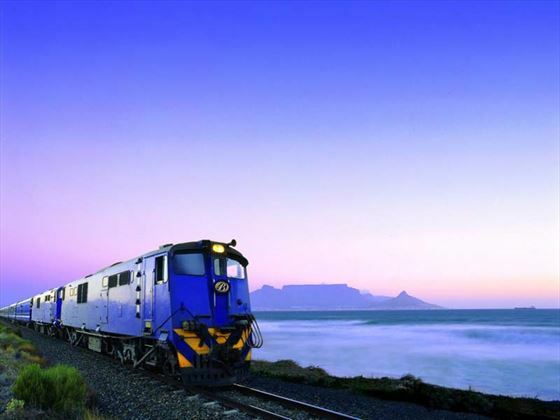 08:30-08:50 The Blue Train departs from Cape Town Station. 11:30 - 13:00 First sitting for Brunch. 14:35 - 15:15 The Blue Train arrives at Matjiesfontein for a 45 minute off-the-train excursion. Note: On arrival at Matjiesfontein you are invited for a glass of sherry at the bar. The sherry glass engraved with The Blue Train logo is a memento for guests to keep. It is like entering a time warp here with Victorian buildings and English lamposts. 15:20 The Blue Train departs for its northbound journey to Pretoria. 16:00 High tea is served in the Lounge Car. 17:00 After an exciting interlude you are free to refresh and enjoy pre-dinner drinks at any one of the fabulous lounges. 18:30 First sitting for dinner. Note: Dinner is an elegant affair and men are requested to wear a jacket and tie and ladies in elegant evening wear. 20:30 Second sitting for dinner. 07:00 - 10:00 Breakfast is served on a first come first serve basis. Breakfast can also be served in-suite at the your request. 15:00 The Blue Train arrives at Pretoria Station. Add on the Blue Train as a perfect start or ending to your South Africa Holiday, be it a self drive, safari or escorted tour. Also the perfect start to a double centre holiday with Mauritius. The Blue Train has two type of Accommodation Suites, the Deluxe Suite and the Luxury Suite. Similar in proportions the Luxury Suite has a larger bathroom. By day, the well presented Blue Train suites offer generous lounging chairs affording fabulous views of Africa. At night-time the suites become sumptuous bedrooms with a choice of either two single beds (twin) or a double bed, all with fine cotton linen and duvets. Considerable attention is paid to guests' needs. There is a desk next to the window, individually-controlled air-conditioning, telephone, safe and TV monitor with on board movie and music channels. The Blue Train has two lovely lounges: the main lounge and the Club lounge. The Club lounge suits those seeking a peaceful place for after-dinner cognacs, coffees or cigars. This area is the only section of the train designated for smokers. High tea is served each afternoon in the main lounge. All lounges have air-conditioning. 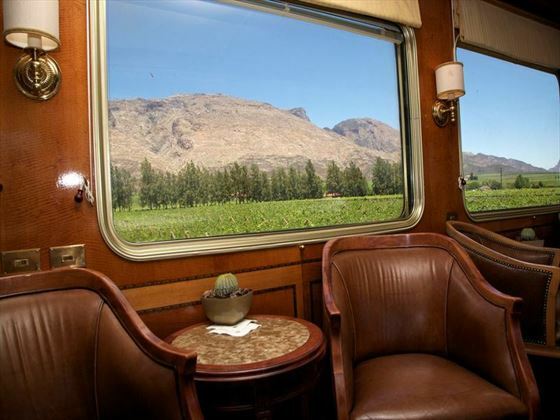 On most journeys the Blue Train has an Observation Car at the back of the train with large windows offering panoramic views of the wonderful and varied landscape. 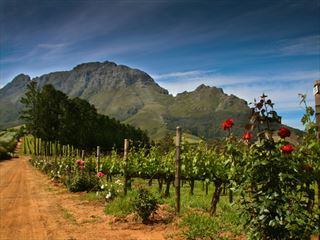 Enjoy luxurious amenities and world-class wines at this beautiful boutique located in South Africa's sensational Winelands.